It feels great to be back blogging after such a long gap and that too with my first guest post. I kept procrastinating this guest post because I haven't held my camera for nearly 10 months and was really doubting myself. The first 10 minutes or so, I was pressing all the wrong buttons on the camera but after a lot of sweating and struggling, I was back on track and managed to take a few clicks before the sunset on a beautiful, sunny Friday. 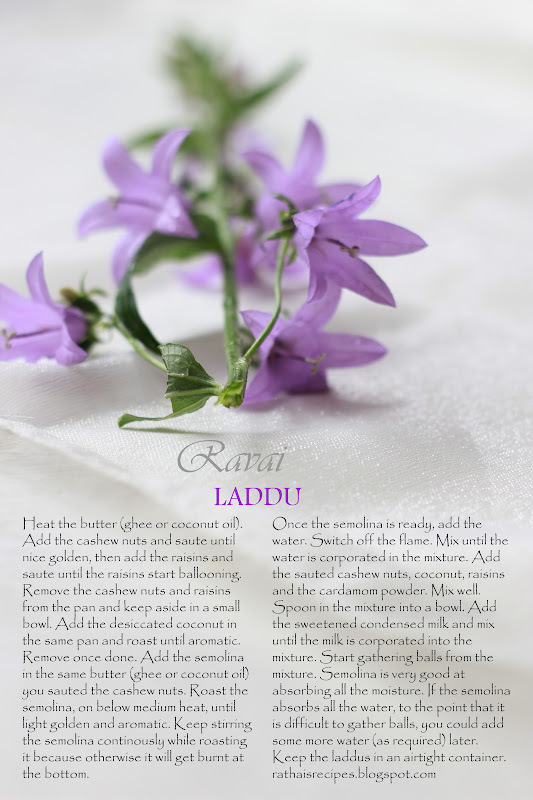 Taruna has a wonderful space filled with eclectic recipes. I'm really thrilled to be guest-posting at her blog, Easyfoodsmith! I'm sharing my mother's recipe for banana fritters which is a favourite at our place and I hope you guys will like it! Thanks a bunch Taruna for giving me this opportunity to share your lovely space and for encouraging me to get back to blogging! 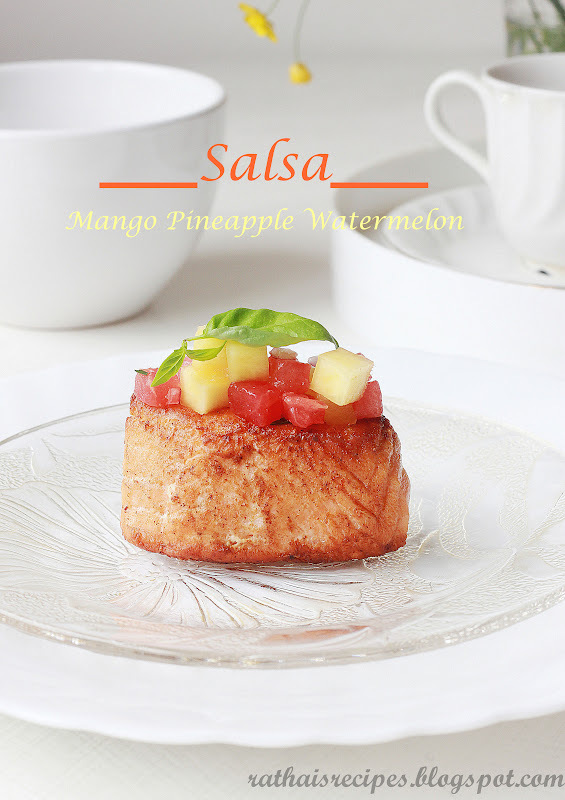 Please head over to EasyfoodSmith to read the entire post and recipe. I hope everyone has had a wonderful Halloween. 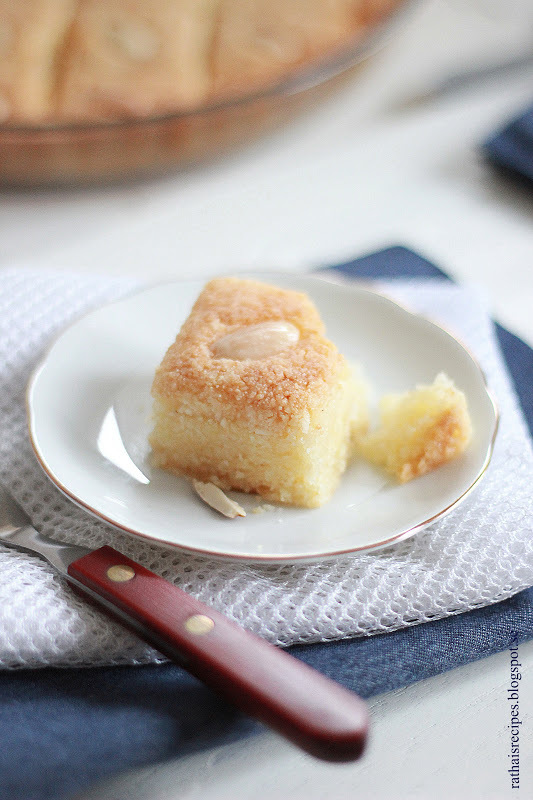 Halloween passed without much fanfare in our family, but something that has been receiving a lot of attention by my family lately is this semolina and coconut cake. Even though everybody in our family has different preferences when it comes to food in general, this cake was relished by all of us, not once but three times last month. This cake doesn't have a cakey texture but it is very soft, moist and slightly crumbly. It smells heavenly from the rosewater and tastes even better on the second day. It goes by many different names and is wildly popular in Greek, Turkey, throughout the Levant and the North African countries, since many of these countries share a common Ottoman heritage. The recipe varies a great deal though, some contain eggs while others don't, some include yogurt while others include milk, some made with butter or clarified butter and others with vegetable oil, some with coconut and others without. I made it egg-less and without milk to store it a little longer. 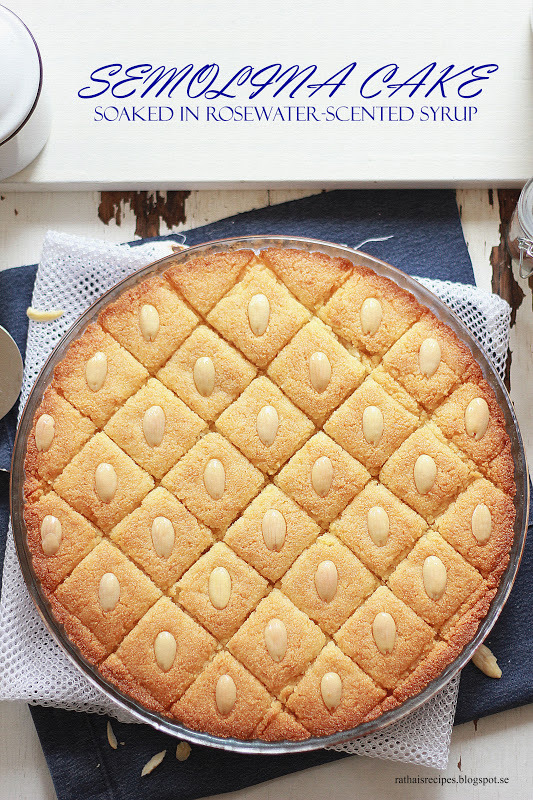 A piece of this delectable semolina cake, and perhaps a cup of Moroccan mint tea, is everything you need to be transcended to another world in this autumn cold. To blanch the almonds, boil the water until it is hot and bubbly. It will take about 7-8 minutes with the lid on. Place the almonds in a small bowl and pour about half of the hot water over the almonds and put a lid on. Allow the almonds to soak in the hot water for about 10 minutes. Take an almond out and rub it between your fingers. If the skin doesn't come off easily allow the almonds to soak for a little longer. If they come off easily, pour the water out and start blanching all the almonds. Spread the almonds on a dry towel and pat dry and keep them in the towel overnight. I cut the almonds into halves but if you find that difficult, you could use whole almonds or store-bought almond flakes. The syrup has to be at room temperature and the cake should be warm when you pour the syrup over the cake, so you have to prepare the syrup before baking the cake. To make the syrup, boil the sugar and the water at medium heat. Stir until the sugar has completely dissolved. Then add the lemon juice and remove the scum (if any) that floats to the top. Add the rosewater and boil until the syrup thickens a little (if you stir with a spoon, it will coat the back of the spoon and if you touch it, the syrup will feel a little thick and slimy). Don't let the syrup boil for a long time and thicken up too much though, it means less syrup. It will take about 15 minutes to boil the syrup. Once ready, remove from stove and allow to come to room temperature. In a large bowl, mix the semolina and the baking soda. Then add the coconut, sugar and salt and mix well. Add the melted butter and yogurt and mix well with a spoon until well combined and it comes together. With 3/4 cup yogurt it all came together for me but you could add a little bit more if you have difficulty it combining everything. Either way, the batter will be thick and come together, almost like a dough. Lightly butter a 27 cm (about 10 inch) non-removable cake pan/pie plate before placing parchment paper (so that the paper doesn't move) and then lightly butter the sides and the bottom (if you use a cake pan with removable bottom, there is a risk that the syrup runs down the sides). Spoon in the cake batter and even it out on top with a spoon. Allow it to rest for 15-20 minutes. Then cut the cake into diamonds or squares (before baking it). 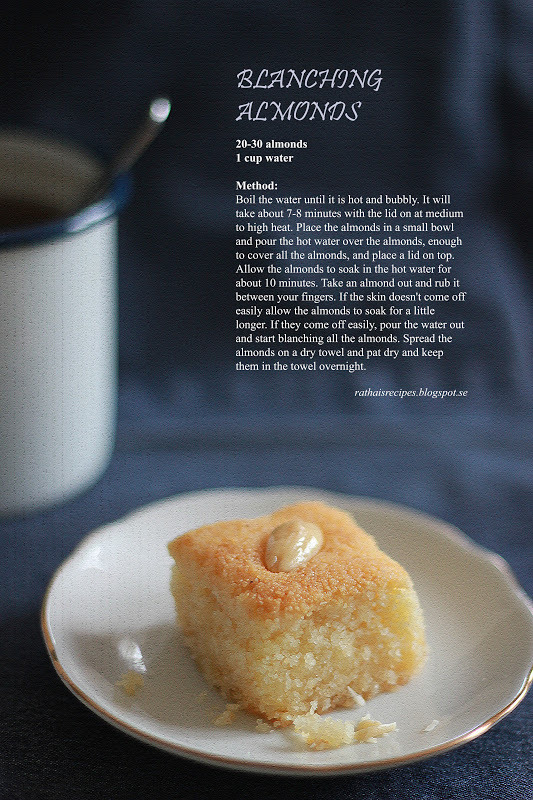 Place the blanched almonds or almond flakes in the middle of each diamond/square and gently press them down a little. Bake the cake at 175 C (350 F) in a preheated oven, in the middle rack for about 20 minutes first. Take the cake out and gently cut it into diamonds/squares again (if you cut the cake when it is fresh out of the oven, it might crumble. This is why it is good to cut it before it is fully baked). Place the cake back into the oven and bake for another 20-25 minutes until it looks golden and crisp on top. Take the cake out and spread the syrup slowly and evenly on top of the cake. 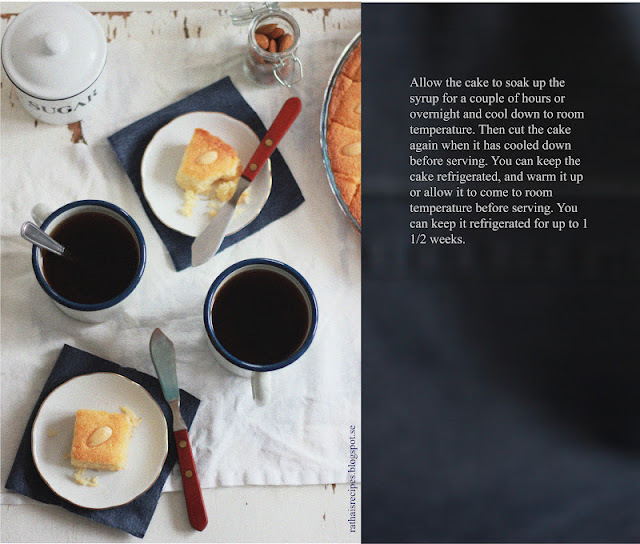 Allow the cake to soak up the syrup for a couple of hours or overnight and cool down to room temperature. Then cut the cake again when it has cooled down before serving. You can keep the cake refrigerated, and warm it up before serving. You have to warm it up before serving, otherwise it will feel like a brick. I don't warm up the whole cake, only the pieces that are to be served - a few seconds in the microwave is enough. You can keep it refrigerated for up to 1 1/2 weeks. This was meant to be a "How to make lemon curd" post that left me with some egg whites that I didn't have the heart to throw away. I usually keep the leftovers in the fridge for later use (which never happens anyway). However this time, the egg whites came to good use. 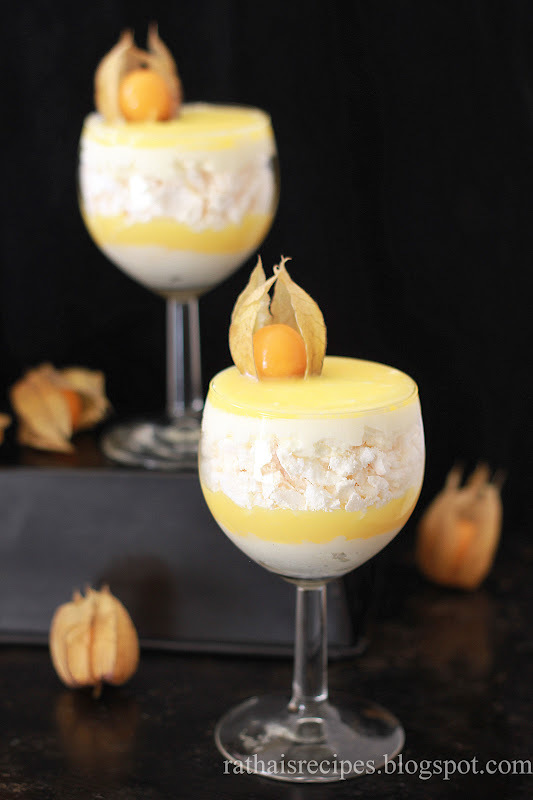 The lemon curd, the crushed meringue and some whipped cream made a simple yet satisfying dessert. It's relatively easy to make and I have tried to be as detailed as I can but if there is anything that is not clear, let me know. For those of you who are not familiar with lemon curd, it is like custard but less sweet with an intense flavour from lemons. It's also sometimes described as lemon-flavoured butter. Whichever way you look at it - it is delicious! The only downside is that they can't be refrigerated for too long (generally upto one week). Feel free to taste and adjust the amount of sugar in the lemon curd. Since I had the lemon curd with meringue, which is very sweet, I made mine very tangy. To cook the lemon curd you could use a double boiler or place a glass bowl with 1 inch of water on the stove. Make sure that the bowl on top does not touch the water underneath. I personally prefer not to cook the lemon curd in a double boiler or metal bowls because the lemon reacts with metals (resulting in a strange aftertaste). The best option is to use a heatproof glass bowl to cook the lemon curd in. 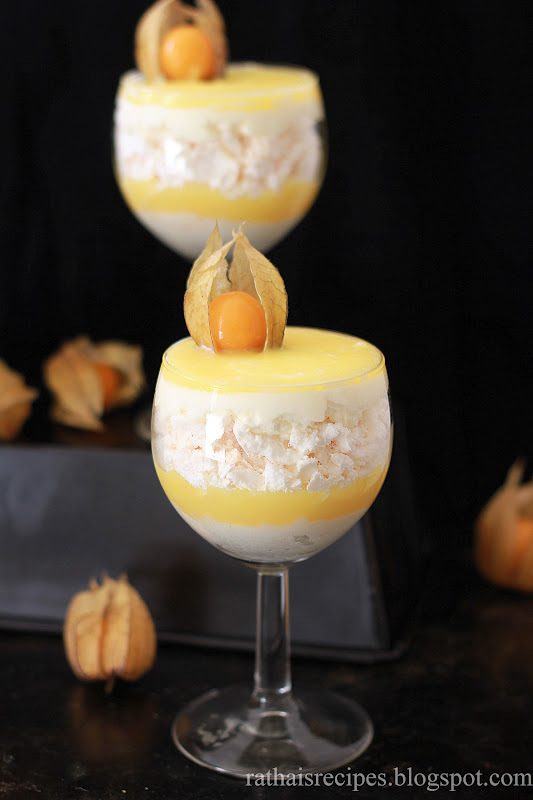 Separate the egg yolks from the egg whites and place the egg yolks in a heat-proof glass bowl or double boiler. When you separate the egg whites from the egg yolks, make sure that there is no trace of egg yolks in the egg whites (that you need to make the meringue). Place the egg whites in a clean and dry bowl, cover and refrigerate until needed. Cut the butter into small sticks and let it come to room temperature. Mix the lemon juice with the sugar (needed for the lemon syrup) and the lemon zest. Whisk the egg yolks until smooth. 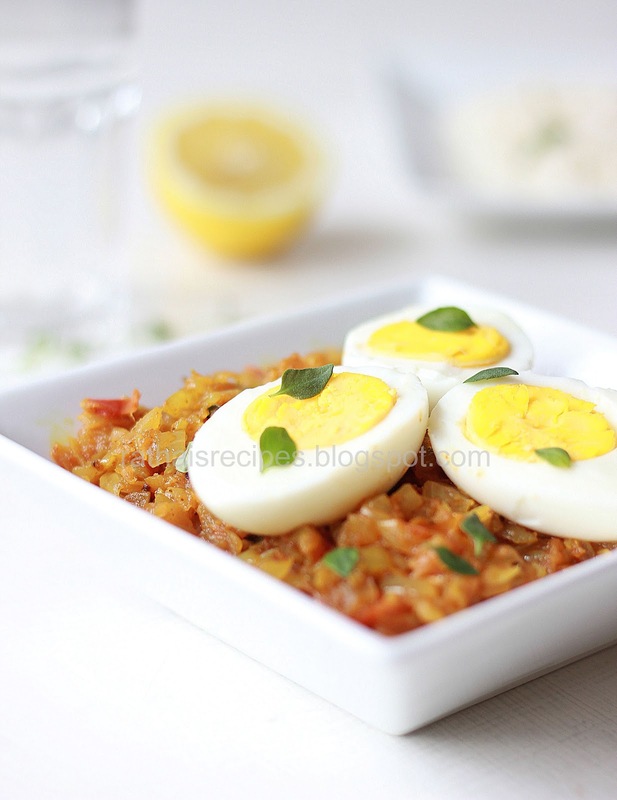 While whisking the egg yolks, gradually add the lemon syrup into the egg mixture. Place the glass bowl with the mixture on top of the cooking pot with the water (that should be on a simmer). Keep stirring the mixture until it thickens at very low temperature (on simmer). The lemon curd is not suppose to boil and get bubbly. If the water underneath is too hot, the lemon curd can start curdling and that's why it is cooked over simmering water that shouldn't touch the bowl on top. Once the lemon curd has thickened (or reached the consistency of hollandaise), taste and add some more sugar as preferred and then add the butter sticks and stir until the butter has completely melted. Take the bowl away from the stove. Strain the lemon curd to get rid of the lemon zest and any lumps that may have formed. Allow the lemon curd to cool to room temperature first, stir and then transfer the lemon curd into a clean and dry jar. Cover and refrigerate for a couple of hours or overnight, until thoroughly chilled. 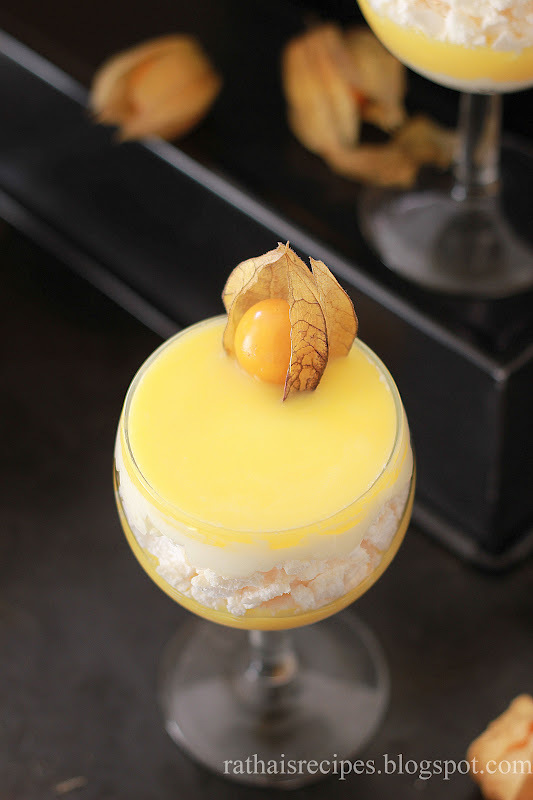 Generally, you can keep the lemon curd refrigerated for upto one week. To make the meringue, take the egg whites out of the fridge and let them come to room temperature. Preheat the oven to 150 C (about 300 F). Please don't use a bowl that is too wide to whisk the egg whites. Start whisking the egg whites with a handmixer at low to medium speed until foamy and bubbly. At this stage you can add the salt or cream of tartar. Continue to whisk and then add the sugar gradually when the meringue is at the pre-soft peak stage to make sure the sugar gets fully dissolved and now you can start whisking at medium speed. Soft peaks mean peaks that curl downwards when you remove the whisk from the mixture. The peaks that appear at the soft peak stage are still soft and not firm (unlike stiff peaks that remain stiff and straight when you remove the whisk). Once you have added the sugar you will notice that the mixture gets really glossy, white and dense as you whisk. You have to stop whisking from time to time to check what stage you are at. It is only when you remove the whisk from the meringue mixture, you will be able to see what kind of peaks are formed. Once you have reached the stiff peak stage, you can stop whisking. At this stage the peaks should be stiff and somewhat, if not completely, straight when you remove the whisk. You will also notice that, the meringue mixture is so firm that even if you turn the bowl upside down, the mixture wont move. Take some of the mixture and rub between your fingers and check if the sugar has been completely dissolved. Line an oven sheet with parchment paper. It's also a good idea to take some of the mixture that is left on the whisk and place them on the underside of each corner of the parchment paper to prevent the paper from sliding. Carefully spoon 12 cookies (or so) out of the meringue using two tablespoons onto the parchment paper. Don't try to flatten the meringue as you do this. Handle it gently. The meringue can sometimes deflate in the oven, if not handled gently. Once the oven is hot, lower the temperature to 90-100 C (about 200-210 F) and place the meringue in the center rack of the oven and allow it to bake for 1 hour and 10 minutes. Halfway through, open the oven and rotate the oven sheet so that all of them are evenly baked. Turn off the oven and let the meringue rest in the oven for some 4-5 hours or so, or overnight. Store them at room temperature in a clean and dry container. 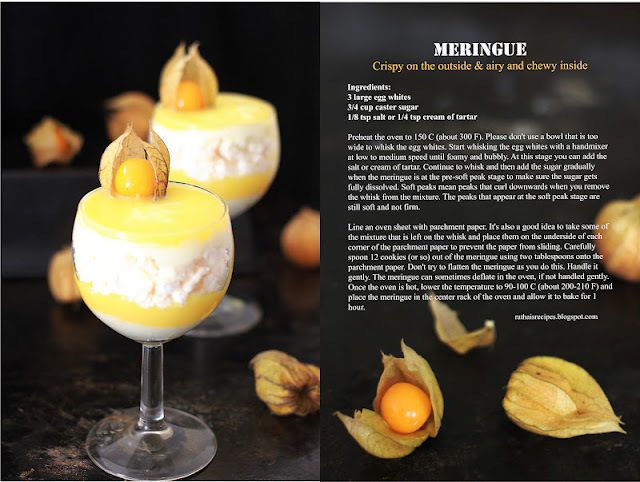 The lemon curd and the meringue is best done a day ahead or at least 4-5 hours ahead of serving because the lemon curd has to be chilled and the meringue has to rest once it has been baked. To assemble the dessert, whip the cream with confectionar's sugar and vanilla extract/vanillin sugar until stiff peaks, ahead before serving and keep it covered and refrigerated until needed. Assemble the dessert in 6 wine glasses, by first placing whipped cream at the bottom of the serving glass. Even out the layer of whipping cream around the edges, so that the lemon curd doesn't sink through the holes to the bottom. Spoon in a small layer of lemon curd over it. Crush the meringue cookies and spread on top of the lemon curd (this will turn out a little messy). Repeat the process until you have lemon curd on the topmost layer (I noticed that it was difficult to make the lemon curd "stay" there. I would probably skip this step next time). Alternatively, you could also place the cream in a piping bag and pipe it out on top and keep it as the topmost layer. Garnish with fruits and/or berries, I served mine with physalis/ground cherries. For more variation, you could also layer with some crumbled pound cake and/or fruits, you could layer pound cake between the cream and the lemon curd. Serve immediately and cold! If you are familiar with Indian desserts you know they are often as sweet and rich as the hot and fiery main courses. The processes to make these are often long and tedious but the outcome always delicious... milk solids that are curdled and separated from the whey to make chenna/paneer; butter that's heated to produce the long-lasting ghee/clarified butter; whole milk that is cooked until thickened to produce the finest khoya/mawa. No effort is spared in bringing out the richness and the best of flavours and aroma out of each ingredient that goes into making these indulgent sweets. Today however, I'm posting a recipe that is less time-consuming than most but nonetheless, one that doesn't compromise on taste. From the initial stage of sauteing the cashew nuts and raisins until golden and juicy till inhaling the pleasant aroma oozing from the roasted semolina and cardamom powder - the whole experience of preparing these laddus is as enjoyable as savouring them. 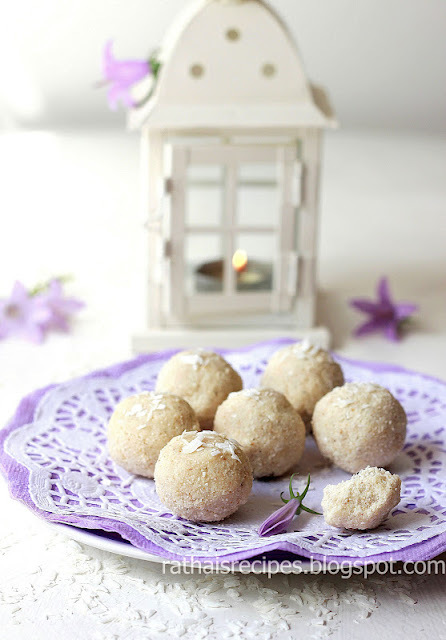 Ravai laddu or sooji laddoo (ravai and sooji being different names for semolina) is one of the few fool-proof Indian sweets you will ever find. Growing up, this was the only type of laddu my mother used to make and as a result, not only do I have an affinity for it, I also learned how to make this on my own at a young age. I can't believe it has taken me so long to post it here. My mother always made these with sweetened condensed milk, not granulated sugar, and that's how I prefer my laddus too. I like the more creamy texture you get from the condensed milk versus the 'grainy' texture you get from granulated sugar. If you have all the ingredients to make these, it wont take you more than 15 minutes to make them and these laddus also have a relatively long shelf life. 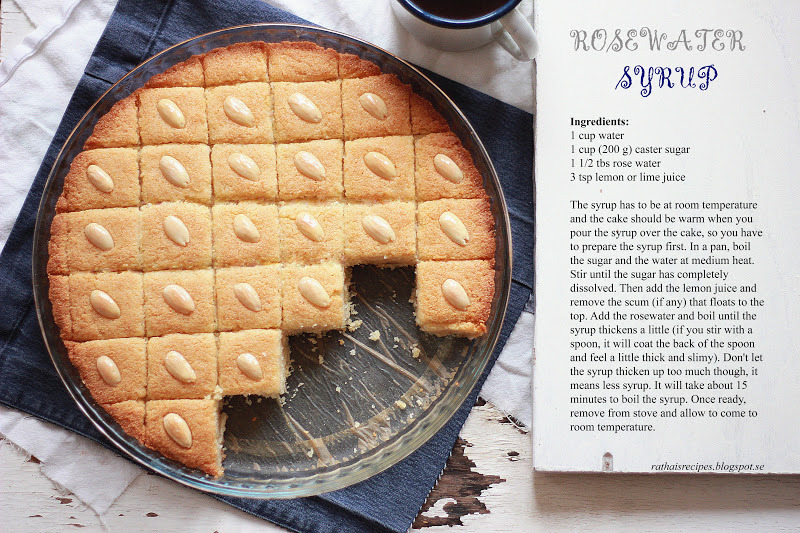 Also, I want to apologize for the half written 'almond cookie' post that I posted sometime back. It was a future post that I was preparing and oopsie .. I pressed the publish button by mistake. I'm really sorry about that! Heat the butter (ghee or coconut oil). Add the cashew nuts and saute until nice golden, then add the raisins and saute until the raisins start ballooning. Remove the cashew nuts and raisins from the pan and keep aside in a small bowl. Add the desiccated coconut in the same pan and roast until aromatic. Remove once done. Add the semolina in the same butter (ghee or coconut oil) you sauted the cashew nuts. Roast the semolina, on below medium heat, until light golden and aromatic. Keep stirring the semolina continously while roasting it because otherwise it will get burnt at the bottom. Once the semolina is ready, switch off the flame. 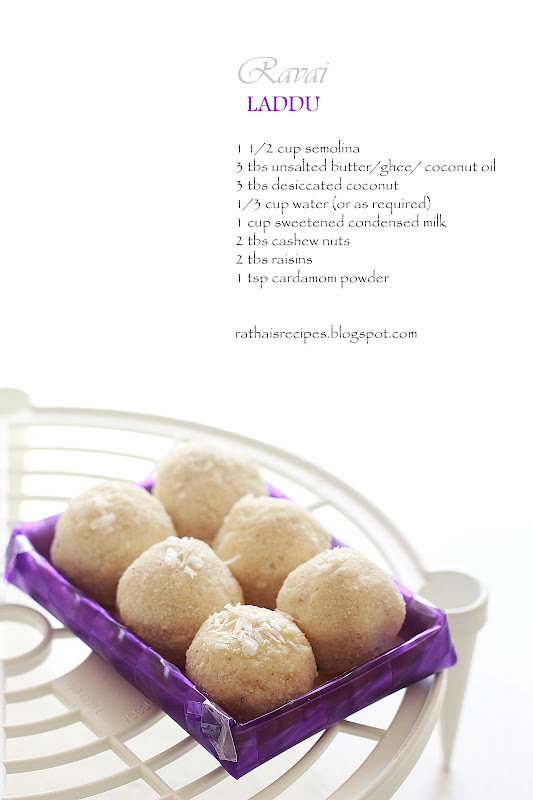 Add the sauted cashew nuts, coconut, raisins and the cardamom powder. Mix well. Spoon in the mixture into a bowl. Then add the sweetened condensed milk while stirring with a fork or a spoon, little by little, and mix until the milk is corporated into the mixture. Wait a couple of minutes if it is too sticky and then stir again (it's a difficult to say how much condensed milk you will need - you might need more or less depending on how warm your mixture is and how quickly it absorbs the moisture and what kind of semolina you use). Start gathering balls from the mixture. 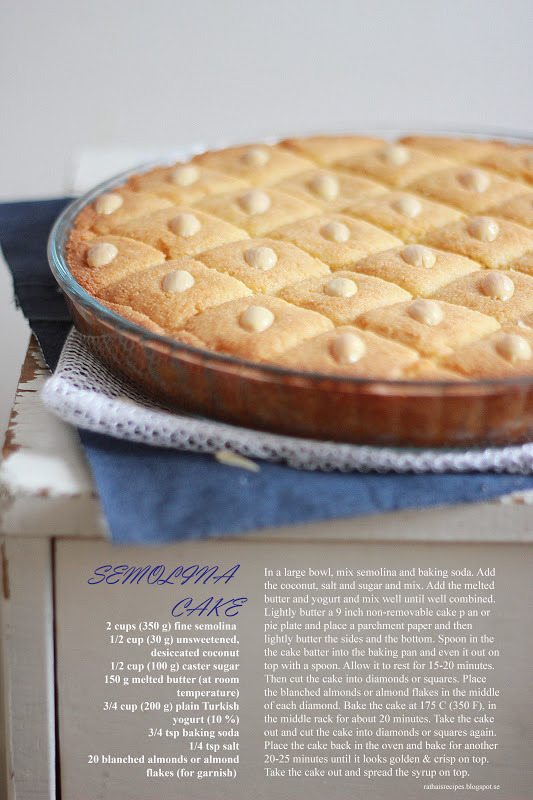 Semolina is very thirsty on water and is good at absorbing all the moisture. If the semolina absorbs all the water, to the point that it is difficult to gather balls, you could add a tad more water (as required) later. When gathering the balls, try to press the balls as tight as you can, so that they don't fall apart later. Let them cool down before serving. I prefer keeping mine at room temperature (but as I understand, they can be refrigerated as well) and can be stored for up to 2 weeks. I have always struggled with eating salads and fresh vegetables and lately I have also noticed that my fruit intake has slowed down considerably and this despite the availability of fresh produce this summer. These days, whatever fruits and berries I have, usually come in the form of apple pie, raspberry crumble bars, blueberry muffins... well, you get the picture. So in an attempt to increase my vitamin intake, I made this salsa. Happy Father's Day to everyone! It feels great to be back blogging after a some break. Thank you and a big hug to everyone who checked on me during my absence. Even though I made this really delicious butterscotch ice cream from smittenkitchen a couple of days ago, I have been in two minds about whether to post it here. Photographing ice cream is more difficult than I thought it would be. I put the ice cream outside to defrost and when I came back, the ice cream looked like soup. I hope you can look beyond that, because the butterscotch/caramel flavour is simply out of this world. 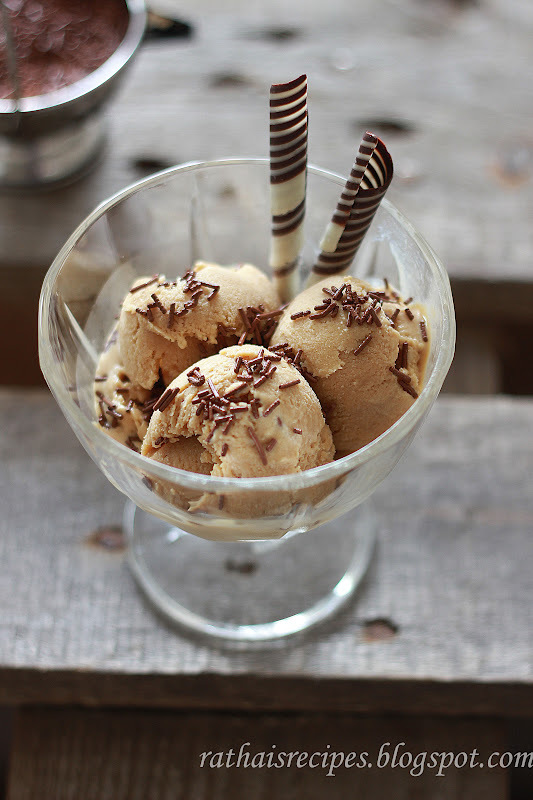 This ice cream is very rich in flavour. If you love butterscotch/caramel, you've got to try this recipe. I believe everyone had a wonderful Mother's Day. 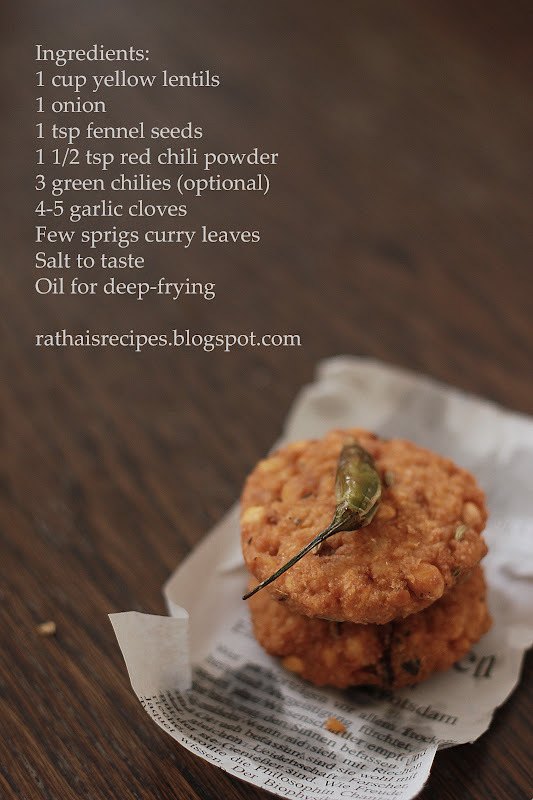 I wanted to post a recipe that I will always associate with my mother today and one that I know she loves too - vadai. Being a diabetic, she rarely indulges in sweetmeat and is more of a snack person. She also happens to be a vegetarian and a very picky eater but one thing she will never be able to resist is deep-fried goodness like these crispy lentil fritters (paruppu vadai) or masala vadai. This vadai goes by many different names but is often sold as masala vadai at restaurants, probably because the word masala conjures such pleasant images to people. 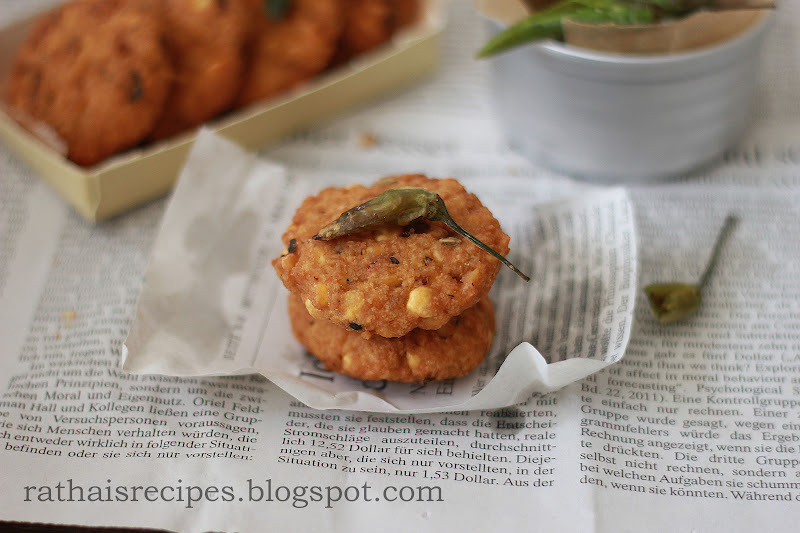 I tried to make these once before, in my early days of cooking, but unfortunately that attempt went bonkers and the vadai fell apart while frying. I did the mistake of not grinding the batter properly. Anyway, I have finished mourning that mishap and have been wanting to give this another try. This time the masala vadai turned out really well and I was told it tasted great too. We don't normally add garlic to this but I was inspired to try these with garlic after seeing a recipe on Rak's Kitchen for the same. I do add ground garlic to falafel and pakoda and since the garlic adds an immense depth of flavour, especially to fried food, it got me curious. Those of you who do not wish to use garlic could substitute the garlic with a pinch of asafoetida (hing). The green chilies are optional and could be added if you prefer your masala vadai to be really hot. Rinse and wash the lentils in water 4 times or so until the water becomes clear and then soak the yellow lentils for 4 hours. Finely chop the onion, garlic cloves and the green chilies (if you are adding them). I prefer to cut the curry leaves with a food scissor as well. After 4 hours the lentils should have doubled in size. Drain the lentils. Put away 1/4 of the lentils and grind the remaining with garlic. Alternatively, grind the fennel seeds as well, because they can be a little domineering in flavor as whole. The batter should be ground coarsely with a generous amount of whole lentils. 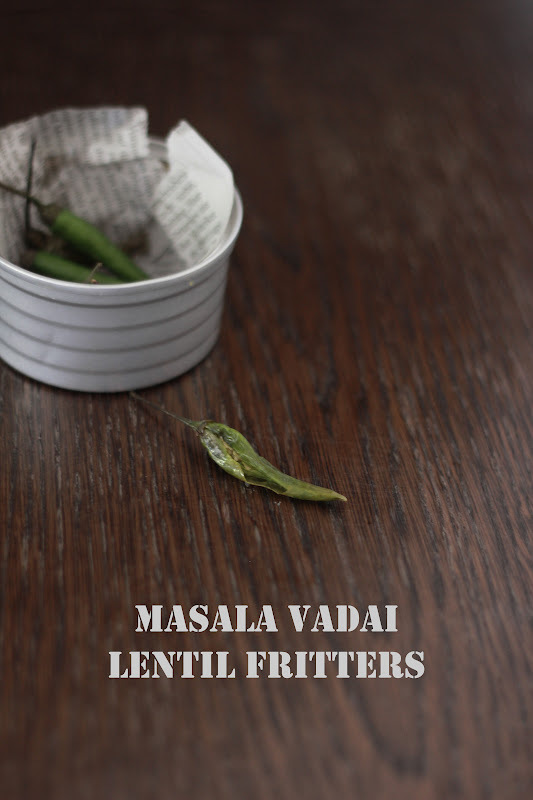 The more whole lentils there are in the vadai, the crunchier the vadai will turn out. So bearing this in mind, don't grind the lentils too much - just enough so as to able to shape them. In a bowl, mix the batter with red chili powder, curry leaves, onion, fennel seeds, salt and green chilies (if you are adding these) and mix/knead well. Heat the oil needed for frying the vadai. Prepare a plate with tissue or absorbent paper to to drain the excessive oil from the deep-fried vadai and keep aside. Pinch off some batter and shape a small ball out of it and then flatten it out little to resemble a small cookie and carefully place one vadai in the oil. Take care not to splash oil while dropping the vadai into the oil. Also, take care not to drop it from a high altitude so as to avoid splashing hot oil around you. Fry it until it looks crisp on medium heat. Once you have fried the first vadai, taste to check whether the salt level is right. Add some more salt at this stage, if needed, and knead the batter before frying the rest of the vadai. Make sure the oil is really hot when dropping the vadai to get a crispy exterior, then lower the heat to medium so that it gets evenly fried. 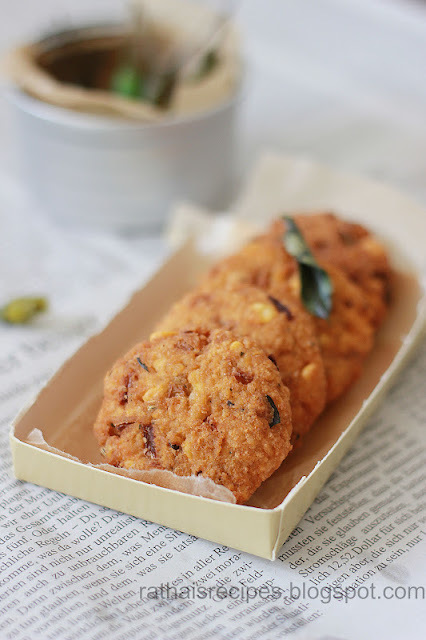 Serve the vadai warm and crispy with chutney/dip/ketchup or enjoy them just the way they are. Good luck! 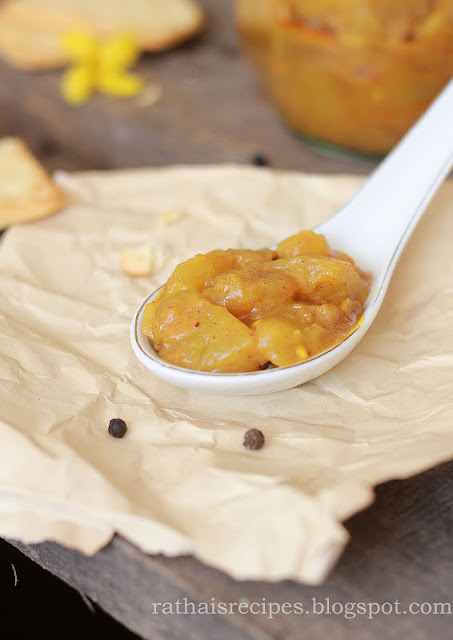 Amba maluwa is a delicious, sweet, sour and spicy Sri Lankan mango curry. I had this curry for the first time at a restaurant and I couldn't figure out what "vegetable" it was but the taste was out of this world. It was part of a traditonal Sri Lankan meal that consisted of perfectly cooked red rice, some other vegetable and bean curries and pappadom/appalam. Unlike the other vegetable and bean curries that were completely dependent on the seasonings, the mango was bursting with flavours and with each bite it tasted differently. It has ever since been one of my favourite curries. For someone who loves eggs, I just noticed that I have very few recipes that involve eggs (not including cakes and bakes here). So my mission now is to add some more egg recipes and I am going to begin with this easy and pretty fool-proof egg thokku recipe. 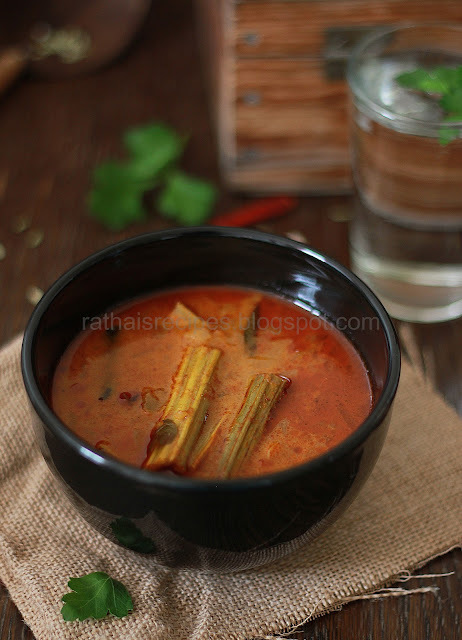 Thokku is a thick and sour curry (it probably derives from the word thokkai which means thick). Thokku is either made from sour vegetables/fruits or tamarind paste (or tomatoes) are added to make it sour. The vegetables are cooked along with spices and without adding any water. You stir-fry the vegetables until the water (from the vegetables) has evaporated. The thokku is lastly layered with a few teaspoons of oil before being sealed. The low water content and the acidity prevents it from being spoilt. And you should always use dry spoon and dry hands when serving or opening thokku. This is an effective way to prepare vegetables and make them last a little longer. At my ancestral home, we had a big murungai tree that would blossom after the monsoon season. I never cared much for ours then - my eyes were always set on the mango trees. It was an old and a most stubborn tree that would only blossom periodically. One day, along with some garden work and for whatever reason, we cut down the twigs and branches of that tree. Even though I had never cared much for it, I was saddened to see the state of that beautiful tree. It was only then that I realized its value. I missed the fragrant white flowers that we would inhale. I missed the shadow that we would take refuge in. And most of all, I missed the sight of these green, thin drumsticks that we would desperately try to fetch by jumping up and down with a long stick.